The attractions of most Tuscan towns make each one worthy of a whole clay’s sightseeing. Arezzo might be similarly lackluster but for Piero della Francesca’s great fresco cycle. Nearby Cortona, by contrast, seduces with its views, its galleries, and its quiet medieval streets. 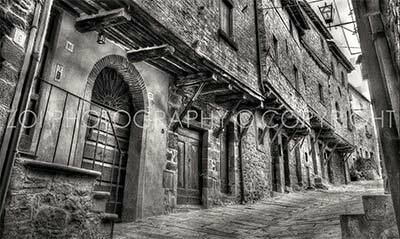 Much the same goes for Montepulciano, as attractive for its own sake as for any surfeit of art and architecture. but each has a sprinkling of masterpieces and monuments within easy reach of Florence. Siena deserves at least that, its calm medieval ambience the perfect antidote to Florence. Villages The siren call of Tuscany’s towns could well leave little time for its villages. No trip to the region, however, would be complete without a visit to San Gimignano and its famous towers. Fewer people find their way to Pienza, a tiny Renaissance jewel, or to Montalcino, heart of the famous Brunello wine region. More are discovering Monteriggioni, a short hop from Siena, and perhaps the most perfect of Tuscany’s fortified villages. Close by stand three beautiful abbeys Sant’Antimo, San Galgano, and Monte Oliveto Maggiore, all fascinating monuments to Tuscany’s long monastic tradition. Cortona mia has selected the most relevant places accessible from Cortona. Montepulciano is a perfect day trip from Cortona, and only a 40 minute drive by car. It is very popular for its “Nobile di Montepulciano” wine, which is one of the most appreciated Italian wines, both in Italy and abroad. The town has numerous wine cellars offering free wine tasting, often accompanied with cheese, and many of them have a terrace with panoramic views. We suggest that you start your visit from Porta al Prato and walk along the corso (main street), until you reach front of the Church of Sant’ Agostino, where a crucifix attributed to Donatello is displayed. Continuning along the Corso, you reach the beautiful Piazza Grande, the focus of the city, surrounded by the Duomo, the Palazzo Comunale, the Palazzo Tarugi and the Palazzo Contucci, where you’ll find extensive wine cellars and wine tastings. This square has also been used as a film set for big movies, including Twilight. Continue on to the Fortezza and the Church of Santa Maria dei Servi: from here you are able to look down to enjoy another famous sight of Montepulciano, the beautiful church of San Biagio. Entrance is free and the church can be reached by a 10 minute walk downhill. Completely isolated and set in the middle of the countryside, this church is made of stone and is also one of the best examples of Renaissance art. It is possible to travel from Cortona to Arezzo by car, or by train from Camucia train station, where there are many trains running every two hours, and often more frequently during busy hours of the day. Whether traveling by train or car, it is definitely worth the 25 minutes or so to get there to see one of the region’s most important fresco cycles, Piero della Francesca’s Legend of the True Cross. These days the town’s material well-being derives from its jewellers and goldsmiths, but in the past its position at the crossroads of trade routes over the Apennines brought it fame and prosperity. It ranked highly in the Etruscan federation of cities, and maintained a high profile under Roman rule. In 1348, however, after centuries of independence, it fell into Florentine clutches. Piero della Francesca, born in nearby Sansepolcro, has his masterpiece in the church of San Francesco (free entry and open daily between the hours of 7am-12.30pm and 3pm-6.30pm). Started in 1457, the theme of the fresco cycle is the story of the cross used to crucify Christ. In tracing its story from seed to crucifix, though, it also addressed the story of humanity’s redemption from the starting point of original sin. This said, the sequence of events in the panels follows an artistic rather than a narrative logic. Its various battle scenes, for example, are faced off against each other, not placed in their rightful historical position. As a painter, Piero della Francesca was very concerned with the mathematics of perspective, fusing them with pale colours and enigmatic figures to produce measured but almost mystical compositions. If the fresco’s story is too much to follow, then take pleasure in the simple details. 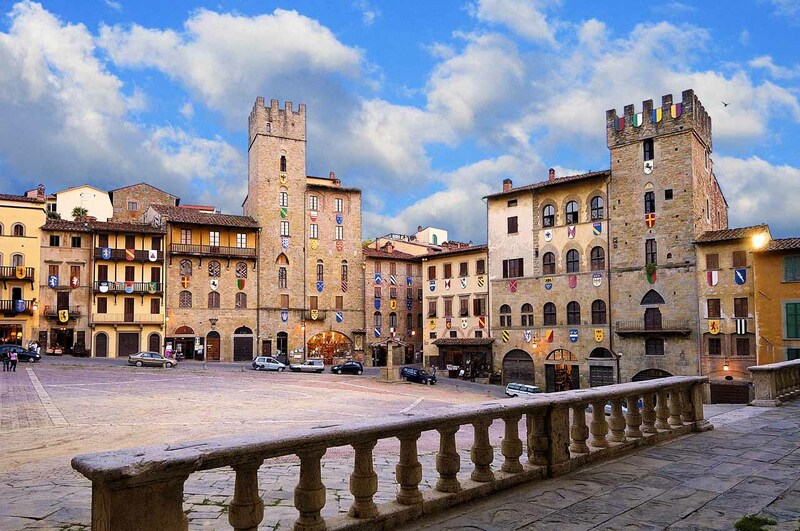 Arezzo is one of the wealthiest cities in Tuscany. Its ancient origins are verified by the stone tools and the Man of the Elm found, dating back to the Paleolithic era. The Etruscan Arretium was founded around 9th century B.C., and quickly became one of the most important cities in Tuscany, playing an important role over the centuries due to its strategic position along the Via Cassia. Even though the Medieval centre was destroyed during World War II, Arezzo has many monuments, churches and museums remaining that offer visitors a chance to step back in time. The Church of San Francesco is probably the most famous in Arezzo, with the incredible Early Renaissance fresco cycle by Piero della Francesca depicting the Legend of the True Cross. Other important sites include the Medicean Fortress, the Cathedral dedicated to San Donato, the Roman Amphitheatre and the Church of San Domenico with the wooden Crucifix by Cimabue. Traveling from to Cortona to Pienza takes approximately 50 minutes, and only possible by car. The road is pleasant and easy to drive, with panoramic views and some curves along the final stretch. The village of Pienza is located in gentle undulating hills, dominating all of the Orcia Valley with extraordinary views. This charming village is known widely as the “ideal city of the Renaissance”, the creation of the great humanist Enea Silvio Piccolomini, who later became Pope Pius II. The Duomo or Cattedrale dell’Assunta hosts very fine paintings by the most renowned artists of the period, while the octagonal bell tower standing over the ancient crypt with the same octagonal shape points to the sky. Both dominate the landscape as you view Pienza from afar. The imposing Palazzo Piccolomini to the right of the Duomo has a fantastic Loggia with a delightful hanging garden from where you can enjoy unique and breathtaking panoramas of the Val d’Orcia Valley, from Montalcino to Mount Amiata. While you’re in Pienza, take the short walk down the side of the hill on which it sits, following the signs to Pieve di Corsignano. The romanesque church with three naves has its ancient origins in the 7th century, but the present romanesque style is from the 12th century. While the church is relatively empty, each nave has an altar, and when entering, you can see the original baptismal font where both Pope Pius II and his nephew Pope Pius III were baptized to the right. Pienza is also the city of formaggio pecorino, which means Pecorino cheese! The Pecorino of Pienza is a tasty cheese made from sheep’s milk, renowned worldwide and delicious, which can go from a delicate flavour to a decisive one based on how aged it is. The cheese is producted localy from master farmers wgi were originally from Sardinia, the best place for producing cheese in Italy. The town streets are full of small charming shops selling a large quantity of various types of pecorino, from fresh to aged pecorino, that you can taste together with a number of other typical local products, such as fine wines, spices, pici (handmade pasta) and so on. Please do not try to come back to Cortona without first buying some cheese! A visit to the Val d’Orcia is a must, and takes only 1 hours by car from Cortona; offering the richest in terms of natural beauty. If you’re lucky enough to drive there in the Spring, when the wheat has not yet been collected, you will be amazed! Wonderful landscapes, isolated hilltop towns, charming farmhouses and remote rural homes, Medieval castles, sunny rolling hills, avenues of cypress trees, rows of vineyards, olive groves and golden wheat fields are just some of the elements of the fantastic and harmonious landscapes of theVal d’Orcia. The valley is crossed by the Orcia river, from where it derives its name, and since 2004 the area has been protected as a World Heritage Site natural park reserve by UNESCO World Heritage Centre. 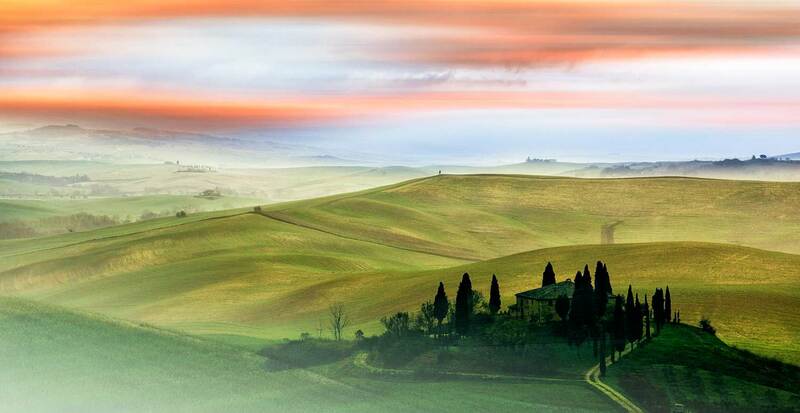 The Val d’Orcia stretches along the provinces of Siena and Grosseto. The nature is the actual absolute protagonist in the Val d’Orcia, with its many different colours according to the season. When coming to Cortona, as with the majority of tourists, you may already have visited Florence, but if you haven’t, it’s a must. Traveling from Cortona to Florence is very easy by train from Camucia train station, with trains running approximately once an hour. All trains stop right in the central railway station of Santa Maria Novella. From here it is really easy to get to the centre of Florence and visit the main sites. If this is a day trip we suggest that you go early in the morning and stay until the evening, where you can catch the last trains in time to take you back. We have made some suggestions on what you should visit on this day trip. From the station let’s head towards the town centre. The first attraction you will find at hand is the fabulous Cathedral “Santa Maria del Fiore”, today known as the world’s largest masonry dome, and where this majestic cathedral features 600 years worth of stunning architecture and art works. If you like you can go on the roof to visit the bell tower, where you can enjoy charming views of Florence from the rooftops. Let’s keep walking through Via Calzaioli (the main street with many shops) to the magnificent Piazza della Signoria to see the Palazzo Vecchio, with the reproduction of Michelangelo’s David at its feet, while the original is located just behind this, at the Galleria dell’Accademia. Next let’s visit the Gallery of Uffizzi, one of the largest art museums in the world (you need to book a ticket in advance and it will take at last 3|4 hours). From here we head to the Boboli Gardens, created by the Medici family in the 16th century. A mandatory stop at the “Mercato Nuovo” (New Market), the oldest central market of Florence to do some shopping, where we search for the Fountain Boar to touch his nose for luck… A few steps from here you are able to walk on the amazing old bridge, where you should stop half way across to admire the River Arno, and the breathtaking beauty of Florence in all of its entirety. Finally, head to the Pitti Palace, which was the long the residence of Florence’s rulers until 1919, when it was handed over to the Italian state, which transformed the palace into a museum complex. Last but not least is the wonderful panoramic view of Florence from Piazzale Michelangelo, which is a 40 minute walk, or short drive by bus or taxi. Transport car or train: about 1 hour 15 minutes. The best way to go to Siena from Cortona is by car (about a 1 hour drive), but you can also catch a train from Camucia train station to Chiusi, from where you switch to a local train to Siena. Siena is one of the most important medieval cities in Italy, and a trip worth making, as it is one of the “must see” town in Italy. The most famous part of the town is the central piazza known as Piazza del Campo, known worldwide for the famous medieval Palio that runs here, a horse race run around the piazza twice each Summer. The city sits above three hills with its heart in the huge piazza del Campo, where the Roman forum used to be. The brick pavement of the piazza represents the council and symbolizes the Madonna’s cloak which shelters Siena. The Piazza del Campo is dominated by the red Palazzo Pubblico and its tower, Torre del Mangia. If you feel energetic you can climb the 500+ steps, to watch an amazing panorama of the city. The Museum inside of Palazzo pubblico offers some of the greatest of Sienese paintings. The Sala del Concistoro houses one of Domenico Beccafumi’s best works, ceiling frescoes of allegories on the virtues of Siena’s medieval government. But it is the Sala del Mappamondo and the Sale della Pace that hold the palaces’s highlights: Simone Martini’s huge Maestà and Equestrian Portrait of Guidoriccio da Fogliano and Ambrogio Lorenzetti’s Allegories of Good and Bad Government, once considered the most important cycle of secular paintings of the Middle Ages. The magnificent complex of the Cathedral of Siena and its Duomo houses a series of some of the most important monuments of the European artistic panorama. With more than one million visitors every year, the Cathedral without doubt represents the fulcrum of the entire complex, while other significant elements include the Crypt, the Baptistry and the Museo dell’Opera, all part of the impressive mass formed by the “Duomo Vecchio” (Old Cathedral), and the “Duomo Nuovo” (New Cathedral). Visitors travel along a memorable itinerary of self discovery and truth of faith through culture and art, the result of more than a millennium of Western history. 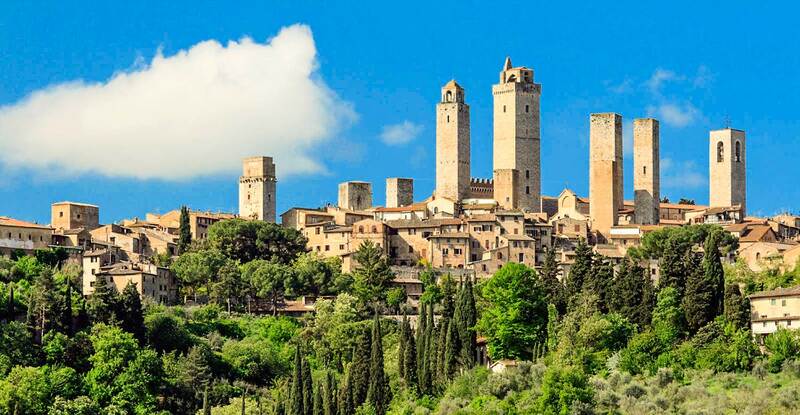 Probably one of the longest journeys from Cortona is to San Gimignano, for which you must travel by car. Most of the road is straight but you can’t avoid the curves. The journey is compensated by the excellent Tuscan landscape. San Gimignano is a small walled town, famous for its medieval architecture and towers that rise above the surrounding buildings, and offers an impressive view of the town from the surrounding valley. At the height of its glory they called the medieval town New York, San Gimignano’s patrician families had built around 72 tower-houses as symbols of their wealth and power. Although only 14 towers have survived, San Gimignano still retains its feudal atmosphere and appearance. Recognized as a UNESCO World Heritage Site since 1990, San Gimignano offers visitors the chance to step back in time, while enjoying its local products, including saffron and its white wine, the Vernaccia di San Gimignano. Don’t forget to visit San Gimignano Bell Tower and the amazing museum of medieval Tortures. It is best to travel from Cortona to the Abbey by car. The road is easy, although the Abbey is quite a distance from Cortona, taking approximately 1 hour and 25 minutes. San Galgano is a Catholic saint from Tuscany. He was born in Chiusdino, in the modern province of Siena, Italy. His mother’s name was Dionigia, while his father’s name (Guido or Guidotto) only appeared in a document dated in the 16th century, when the last name Guidotti was attributed. The canonization process to declare Galgano a saint started in 1185, only a few years after his death, and his canonization was the first conducted with a formal process by the Roman Church. A lot of Saint Galgano’s life is known through the documents of the canonization process in 1185 and other Vitae: Legenda beati Galgani by anonymous, Legenda beati Galgani confessoris by an unknown Cistercian monk, Leggenda di Sancto Galgano, Vita sancti Galgani de Senis, Vita beati Galgani. Galgano led a ruthless life in his early years, but later abandoned it in favour of a pious hermitage in the place now known as Rotonda di Montesiepi. His mother Dionigia reported that Galgano had two visions, both involving Archangel Michael: in the first vision the Archangel told Galgano that he was going to be protected by the Archangel himself. In the second vision, Galgano was following the Archangel and they arrived at the hill of Monte Siepi, where they met the twelve Apostles and the Creator himself. After the visions, Galgano’s horse refused to obey his orders and led him to the top of Monte Siepi where his visions took place. Convinced that this was a sign, Galgano decided to plant a cross. Since he had no way to make one of wood, he planted his sword in the ground. Immediately the sword became one piece with the ground so that nobody could remove it. Near the ruins of San Galgano Abbey at the Rotonda at Montesiepi, a round church was built over his tomb, where pilgrims came in large numbers and miracles were claimed. In that year Cistercian monks took over Monte Siepi at the request of Hugh, bishop of Volterra, but most of Galgano’s monks left, scattered over Tuscany, and became Augustinian hermits. 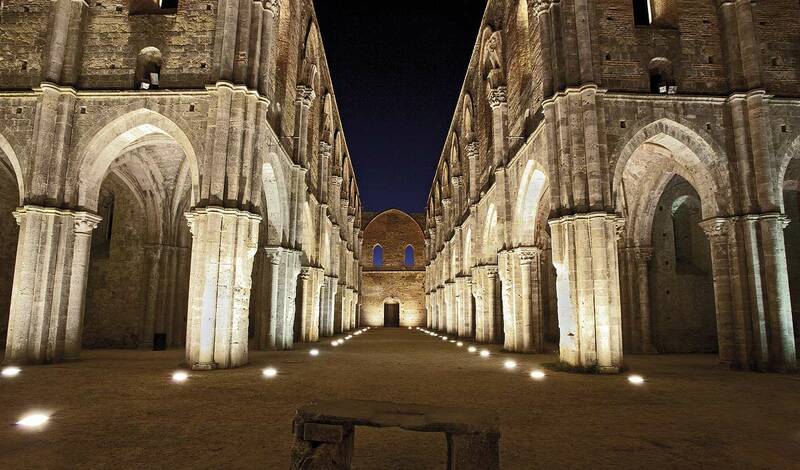 By 1220 a large Cistercian monastery was built below Galgano’s hermitage: they then claimed him as a Cistercian saint. His cult was lively in Siena and Volterra, where numerous representations survive. The ruins of his hermitage can still be seen, while his cloak is kept in the church of Santuccio at Siena. Within a 20 minute drive by car or by train you can reach Umbria and Lake Trasimeno, the fourth largest lake in Italy, with a surface area of 128 km2 (49.4 sq miles). Only two minor streams flow directly into the Lake, with none flowing out. In 1995 a natural park was established over the entire surface and shores. A 50 km (31 mi) bicycle path was opened in 2003 around the lake that allows tourists to explore it. There are also cross-country paths, especially over the hills on the eastern side. Half of Trasimeno is surrounded by hills, rich in olives that are an important agricultural resource. On the western shore, near Tuscany, there are vineyards, and fruit and vegetables are grown. The hills are much lower and the climate is warmer. Monte Subasio near Assisi, about 70 km (43 miles) to the east, and Monte Amiata, about 70 km (43 miles) to the west, can be seen. The vegetation includes pines, willows and poplars around the shores, many over 30 m tall. The main towns to visit are Passignano sul Trasimeno, (perfect to spend a Sunday and dinner with family, and in Summer there is a beach with bar and swimming pool) Tuoro, (from here you get the boat to visit one of the lake’s islands “Maggiore”) Monte del Lago, Torricella (perfect in Summer to relax and sunbathe) , San Feliciano, San Arcangelo, Castiglione del Lago, (where you can also arrive by train direct from Camucia train station. Don’t forget to visit the Medieval Fortress built in 1247 by Frederic II of Swabia. Castiglione del Lago has the longest shore) and Borghetto (where here you can enjoy the best lake fish restaurants). Surrounding the lake are other old small towns, and isolated castles, like Zocco castle and a tower near Passignano. Assisi is an Umbrian town near Perugia, on the western flank of Monte Subasio. Cortona is very close to the Umbrian border and so it is very easy to get to and visit Assisi in just one day. You can go by car, or by train (from Camucia train station and then at San Giovanni train station to Perugia, where you can take a taxi or bus to reach the town. 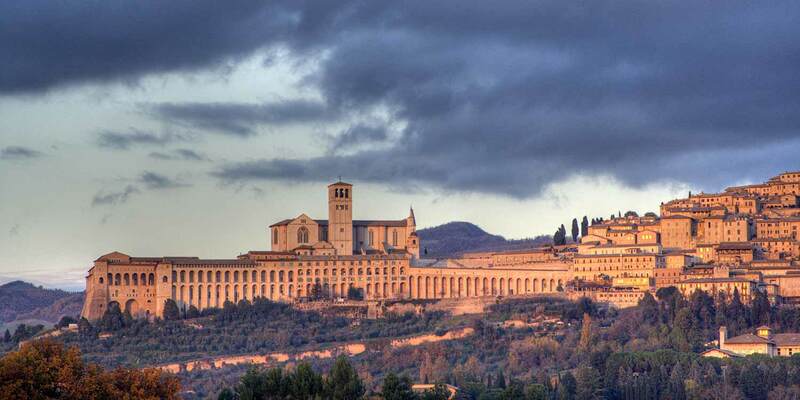 Assisi was the birthplace of St. Francis, who founded the Franciscan religious order in the town in 1208, and St. Clare (Chiara d’Offreducci), the founder of the Poor Sisters, which later became the Order of Poor Clares after her death. The 19th-century Saint Gabriel of Our Lady of Sorrows was also born in Assisi. Assisi has had a rich tradition of art through the centuries and is now home to a number of well known artistic works. Artists Pietro Lorenzetti and Simone Martini worked shoulder to shoulder at Assisi. The Basilica of San Francesco d’Assisi includes a number of artistic works. Simone Martini’s 1317 fresco there reflects the influence of Giotto in realism and the use of brilliant colours. Lorenzetti’s fresco at the lower church of the Basilica includes a series of panels depicting the Crucifixion of Jesus, Deposition from the Cross and Entombment of Christ. The figures Lorenzetti painted display emotions, yet the figures in these scenes are governed by geometric emotional interactions, unlike many prior depictions which appeared to be independent iconic aggregations. Lorenzetti’s 1330 Madonna dei Tramonti also reflects the ongoing influence of Giotto on his Marian art, midway through his career. The Basilica of San Francesco d’Assisi (St. Francis). The Franciscan monastery, il Sacro Convento, and the lower and upper church (Italian: Basilica inferiore and Basilica superiore) of St Francis were begun immediately after his canonization in 1228, and completed in 1253. The lower church has frescoes by the late-medieval artists Cimabue and Giotto; the upper church houses frescoes of scenes in the life of St. Francis previously ascribed to Giotto, but now thought to be by artists of the circle of Pietro Cavallini from Rome. The Basilica was badly damaged by an earthquake on 26 September 1997, during which part of the vault collapsed, killing four people inside the church and taking with it a fresco by Cimabue. The building was closed for two years for restoration. The Cathedral of San Rufino (St. Rufinus), with a Romanesque façade with three rose windows and a 16th century interior; part of it is built on a Roman cistern. Basilica of Santa Chiara (St. Clare) with its massive lateral buttresses, rose window, and simple Gothic interior, begun in 1257, contains the tomb of the namesake saint and 13th century frescoes and paintings. Is possibile to reach Perugia with car or train in about 50 minutes. Perugia is the capital city of the region of Umbria who is bordered by Tuscany, Lazio and Marche. Skyline of Perugia hilltop city and valley The history of Perugia goes back to the Etruscan period. Perugia was one of the main Etruscan cities. The city is also known as the universities town, with the University of Perugia founded in 1308 (about 34,000 students), the University for Foreigners (5,000 students), and some smaller colleges such the Academy of Fine Arts “Pietro Vannucci” (Italian: Accademia di Belle Arti “Pietro Vannucci”) public athenaeum founded on 1573, the Perugia University Institute of Linguistic Mediation for translators and interpreters, the Music Conservatory of Perugia, founded on 1788, and others Institutes. There are annual festivals and events: the Eurochocolate Festival (October), the Umbria Jazz Festival (July), and the International Journalism Festival (in April). 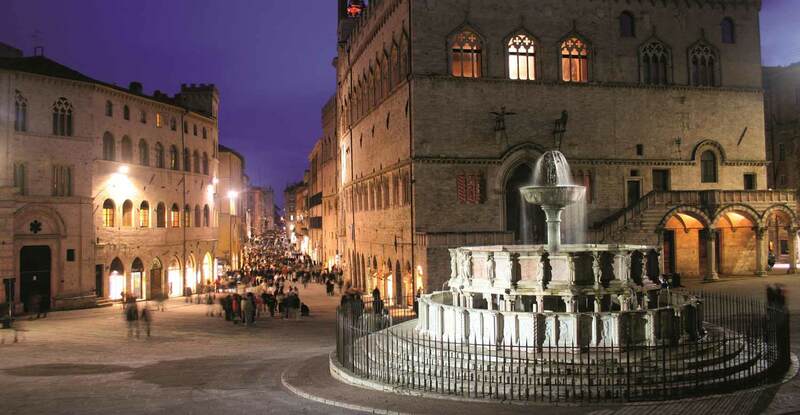 Perugia is a well-known cultural and artistic centre of Italy. The famous painter Pietro Vannucci, nicknamed Perugino, was a native of Città della Pieve near Perugia. He decorated the local Sala del Cambio with a beautiful series of frescoes; eight of his pictures can also be admired in the National Gallery of Umbria. Perugino was the teacher of Raphael, the great Renaissance artist who produced five paintings in Perugia (today no longer in the city) and one fresco. Another famous painter, Pinturicchio, lived in Perugia. Galeazzo Alessi is the most famous architect from Perugia. The city symbol is the griffin, which can be seen in the form of plaques and statues on buildings around the city.